As per the Census 2011, in India, out of the population of 121 crore, 2.68 crore persons are ‘disabled’ which is 2.21% of the total population. 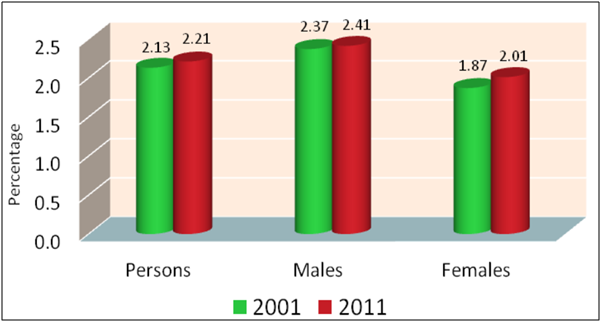 Percentage of disabled persons in India has increased both in rural and urban areas during the last decade. While the proportion of disabled population is higher in rural areas, there has been a decadal in-crease in proportion in urban areas is quite significant too. The graph below depicts the situation in a better way. According to census 2011, in Assam itself, there are 480065 disabled people out of which 257385 are males and 222680 are females. AJMAL FOUNDATION is involved with aiding the physically challenged people who are poor and needy. It provides monetary support along with treatment on a regular basis to such patients. The team of AJMAL FOUNDATION comes across many people who are suffering from various types of disabilities. To take stock of the situation and to share the agonies of the disabled people, our team takes initiative to survey the rural areas and some of the nearby Hospitals including Haji Ajmal Ali Memorial Hospital & Research Centre. After interaction with the physically challenged people, the team observes that the affected people cannot go for costly medical treatments, mainly because of their poverty and lack of support.In most of the cases, the affected is the only bread earner of the family. It is seen that many people suffer from various types of disabilities the country. People from different sections of the society approach the AJMAL FOUNDATION for monetary support and assistive aids for their disability. AJMAL FOUNDATION receives applications from many needy patients from across the state of Assam and outside. Our organization maintains a data bank in order to study and take remedial actions on the affected people. The affected masses are shortlisted and selected by AJMAL FOUNDATION and provided with monetary support and assistive aids. Project Coordinators guide the patients and their families on how to utilize the funds received and also provide them with the knowledge on their disabilities. The coordinators track each and every patient’s progress on a regular basis. A Mega Distribution camp for free of cost distribution of Assistive Aids and Appliances under the ADIP scheme of government of India was organized at Barpeta Government H.S.Schhol, Barpeta on 27th October, 2017, by Artificial Limbs Manufacturing Corporation of India (ALIMCO), Kanpur working under the aegis of Department of Empowerment of Person with Disability (Divyangjan), Ministry of Social Justice and Empowerment, Government of India in close association with Department of Social Welfare, Government of Assam, District Administration, Barpeta and AJMAL FOUNDATION, Hojai. The camp was one of the biggest camps ever to have been conducted in the remote area of Assam in which as much as 3176 pre identified beneficiaries received 5768 numbers of aids and assistive devices of different categories of disabilities. These were manufactured and distributed by ALIMCO valuing over Rs. 191.43 Lakhs under the ADIP scheme of Government of India. It may be mentioned that Mr. Sirajuddin Ajmal, MP, Barpeta and one of the Managing Trustees of AJMAL FOUNDATION, supported the entire beneficiary assessment camps conducted across the district through AJMAL FOUNDATION.